Our summer intern, Sarah, also analyzed several paintings during her time in the Netherlands. These included Portrait of a Couple as Isaac and Rebecca, commonly known as The Jewish Bride by Rembrandt van Rijn, and Girl with a Pearl Earring by Johannes Vermeer. The Netherlands is known for their outpouring of great artists but one that stands out for his distinct style is Rembrandt van Rijn. He was born in a small town in Holland, but left his legacy behind in Amsterdam. There are many museums dedicated to his art throughout the country like his old house and studio located in Amsterdam’s Rembrandt Square, which have now been converted to showing his masterpieces. One of the bigger museums in Amsterdam, the Riijks Museum, houses one of Rembrandts later Baroque works called Portrait of a Couple as Isaac and Rebecca, commonly known as The Jewish Bride, which the famous Vincent Van Gogh loved. Though it’s up for debate as to whom the subjects of the painting are, most art historians believe this work is of a biblical scene, hence the names Isaac and his wife Rebecca from the Old Testament in the book of Genesis. There is a focus on the two figures in the center of the horizontal canvas and a lack of any other scenery or subject, which serves to heighten the intimacy between the two in their tender embrace. Rembrandt made the choice to not focus on the larger narrative of the story, but instead a small moment in their relationship by highlighting the humanistic characteristic of affection between a couple and their shared gentle touch. He exhibited his knowledge of iconographic history but twisted it to use his own narrative and perspective by playing up the shared intimacy seen between the two. 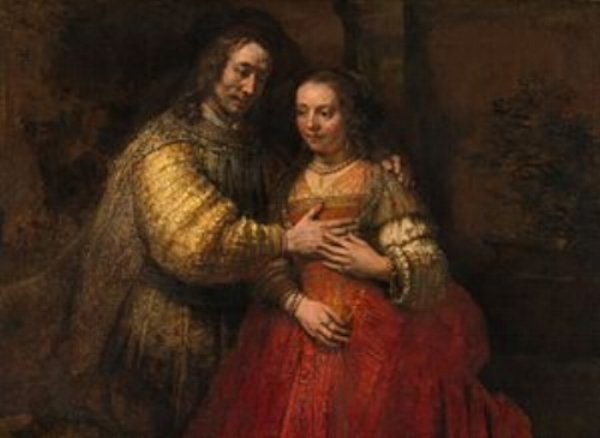 Rembrandt decided to paint Isaac and Rebecca because they modeled true love through their steadfast dedication with their faith. They were refugees in a new land and Isaac feared they would be killed for his wife’s undeniable beauty, so they said they were siblings. In this painting, it is inferred that the King Abimelech has just caught Isaac touching his wife Rebecca in a tender embrace. After the King witnesses this shared moment, Isaac is covering up Rebecca in a sign of modesty. Rembrandt doesn’t show the King but only the love shared between the two biblical figures, which makes this such a powerful love image. 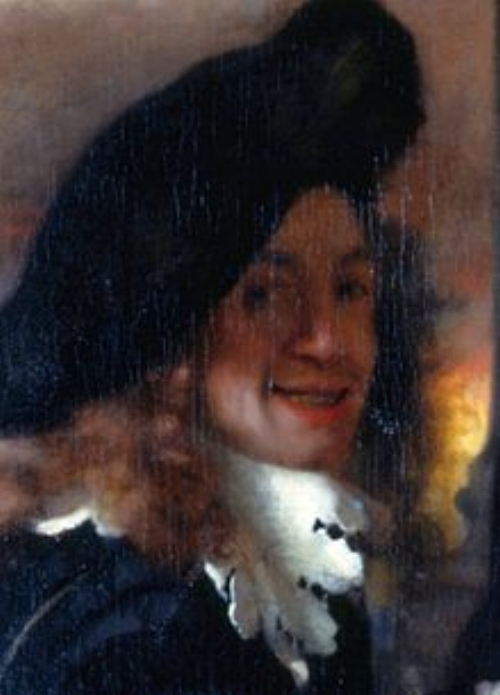 During the Dutch Golden Age, which took place during the 17th century, portrait historié was a very popular style often used with patrons dressing in biblical or mythical costumes. This is a perfect blend for Rembrandt, sticking with the artistic trends of his time but also showing his distinct artistic hand coming through within his painting techniques of portraits, heavy and light amounts of paint, and the use of emotion and expression within the subjects. There are so many details seen throughout the painting, especially within the clothing that it creates a sculptural quality. In this work, he used heavy paints to create the look of rich luxurious fabrics with a palette knife to create the impasto layering effect and lighter strokes for smaller details, like her gold and pearled jewelry. They are equally dressed in rich clothing shown through the material choice, her red color dye, the gold detailing, and her arms and neck covered in pearls. The overall piece is breathtaking and I stood there for a long period of time just like Van Gogh examining it. Your eye is drawn to all the little details and the rich, warm toned colors of the work. The love story shared between them also brings the viewer in to share that space with them, a sense that is heightened by the dark background which serves to embrace you in the moment. 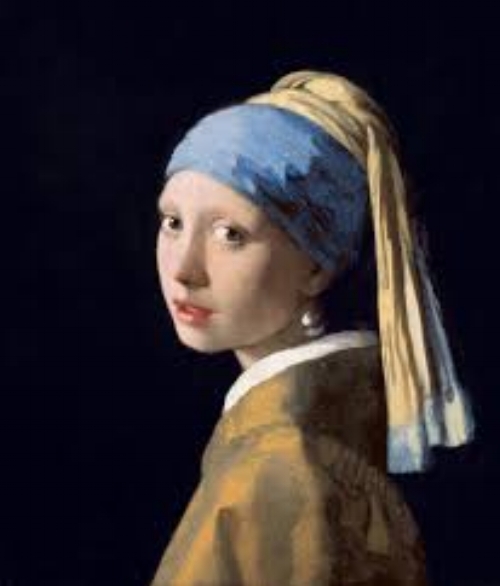 Another classic painting I saw while studying abroad in the Netherlands was the Girl with a Pearl Earring, housed in the Mauritshuis museum in The Hague. Painted by Johannes Vermeer during the Dutch Golden Age in 1665, this is a classic artwork to study and write about. I decided to write about this piece due to how much I have studied Vermeer in my art history courses at the University of Missouri, so I thought this was a perfect fit to analyze. Vermeer was a skillful Dutch painter who specialized in still lifes of Dutch middle class families . Although Vermeer sold this painting for pennies, it is now recognizable worldwide for its classic beauty and lives up to all its artistic hype when viewed in person. The painting is renowned for its portrayal of a young Dutch girl with a large pearl earring, which serves as the defining feature of the work. During our tour, the guide kept specifying that the girl in the painting is completely unknown and that’s what makes the work special. Even though its not believed to be a painting of someone in particular, some art historians believe it to be his eldest daughter Maria because she was a young teenager at the time the painting was created. Back in the 17th century, a portrait would be praised for its likeness to the subject and since the girl in the pearl earring isn’t idealized, it is believed to be an accurate impression of the mystery girl. She is painted looking back at us with a focus on her facial expression and lighting. Because of how skillfully he executed painting her, it is also believed to be a tronie , which is often seen in Dutch art as a painting looking to uncover and study the human expression on a subject with exaggeration and not intended to be a portrait. Her gaze is what brings the viewer in, as if we have caught her attention. With her mouth slightly gaped open, face relaxed, eyes wide open, and dressed in a luxurious blue and gold Turkish turban, a phrase I use loosely, she is painted in enhanced realism. The shiny drop pearl earring is the star of the painting with its bright reflection and huge size. This reflection on the pearl is also reflected on her face with that ever so soft white dot in the center of the bottom lip. In person, this painting is mesmerizing just from her gaze alone. The subtle emotion that comes through is very easy to read in person and is soul capturing with the innocence and purity that is evoked. The color choice is very classic Vermeer with intense blues, yellows, and greens that were not commonly used to paint with because of how expensive the pigments were. He had limited color options compared to the modern painter, but chose to use costly paints to show off of his expensive palette with his bright ultra marine blues and dazzling yellows. Keeping with the Dutch tradition in his paintings, he also chose to paint her with a classic dark Dutch background. This helped bring out the focal point in the center, the girl with the pearl earring. The choice to put her in a turban was also common in the Dutch Golden Age. It was a symbol of appreciation of imported objects but it wasn’t necessarily from Turkey but an umbrella term used for all exotic goods (a little unclear). He probably put her in one for the artistic trend as well as to show off his skillset of layering a 3D object in 2D form. Overall, this painting emulates the classical style of art during the Dutch Golden Age. It was so fun to finally see this art in person after studying it in textbooks for years. A huge crowd surrounded the smaller painting, so after a little wait I was able to get up and see it well. Trust me it was worth the wait, especially to see that shimmer in the pearl.